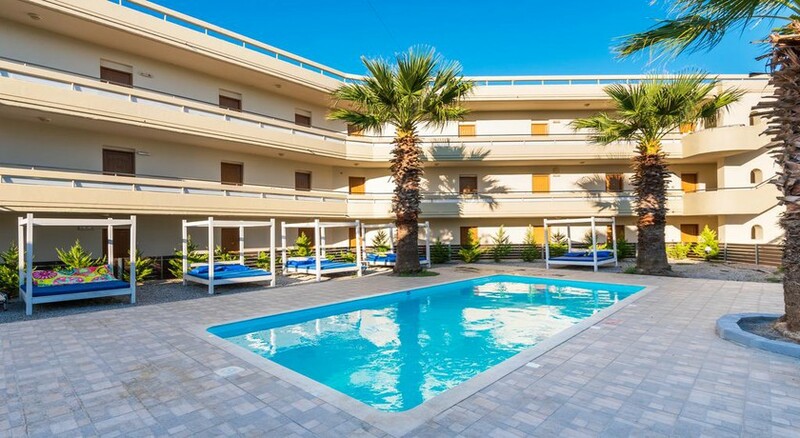 The Delfinia Resort Hotel in Rhodes is a lovely hotel that offers a pleasant and comfortable stay to its guests. The hotel boasts on an onsite water park with water slides and other aquatic activities. The guestrooms at the resort hotel are spacious and bright giving guests a relaxing feel. 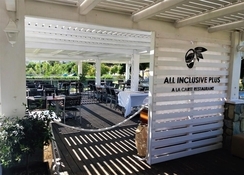 The onsite restaurant serves a variety of cuisines. Families travelling with children can take advantage of the kid’s menu offered at the restaurant. Postal-service, money exchange, 24-hour reception, lobby with comfortable seating and lounge corner, lovely cocktail bar with spectacular mountain views, spacious indoor fully air-conditioned restaurant are a few facilities. The attractive, modern Delfinia Resort Hotel is situated in the beautiful landscape of Kolymbia, on the east coast of Rhodes, 25km from the city centre of Rhodes, 25 km from the well-known village of Lindos and only 5.5km from the wonderful sandy beach of Tsampika (regular bus services to all these directions). The sand and shingle beach of Kolymbia is only 350m away. The Rhodes international airport is about 30km from the hotel. Delfinia Resort consists of a main building and three separate buildings surrounded by a beautiful garden. Ideal for families and couples or singles who wish to have an unforgettable holiday. The total number of rooms is 147, all of which offer bathroom with bath tub or shower, balcony or terrace, telephone, and satellite TV. Safe box with extra charge, fridge and air-conditioning are available in all rooms. The hotel operates on All Inclusive basis including breakfast, lunch and dinner served in buffet style in the hotel's main restaurant. From 10am until 11pm local alcoholic drinks and non-alcoholic drinks are served in hotels bars. Ice cream for the children from 11am to 5pm. All major credit cards are accepted in the hotel as form of payment. 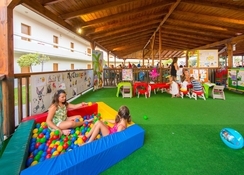 For children there is a Mini Club (10:30am – 2pm and 4:30pm – 6pm), a well-designed children’s swimming pool, playground, and baby cots. During your stay in the hotel you can make your shopping in our mini-market, and you can spend your time playing billiard, table tennis or mini golf. You can also find tennis court nearby, the unique Afandou golf course only 10km away, water sports and scuba diving during high season on the beach of Kolymbia. Hotel's outdoor swimming pool with a separate pool for children have their own sun terrace, sun beds and umbrellas are also available for all the guests wishing to enjoy a relaxed holiday laying around the pool.